If you want a premium robot vacuum from a top brand, you’ll be happy to learn that the Roomba 690 and the Roomba 960 are both available at deep discounts right now on Amazon. 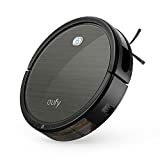 If you want to best possible robot vacuum at the lowest possible price, however, you’ll be even happier to learn that one of our favorite models can be had right now for only $116.99. Clip the $10 coupon on the Eufy BoostIQ RoboVac 11+ Self-Charging Robotic Vacuum Cleaner page to get the deal, but do it soon because this sucker (get it) may very well sell out soon.